<------ Last week was one of those weeks...you know, the kind where the kids nearly drive you nuts? 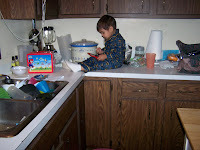 H taught himself to climb up on the counter, all in the name of a Nintendo DS (no, I didn't do the dishes that day). I had told him he couldn't have it cause it needed to be charged, and when I passed back through the kitchen, this is what I found. They tried their hardest to scare the jeepers out of me. 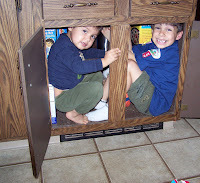 They accomplished the first time cause I had NO idea where they had gone, until they popped out at me, nearly taking out my legs with the cupboard door. Yep, they're creative! lol, uh oh, you are in a world of trouble not that they are conspiring together.